In a recently published article Dr Dieter Lukas and Prof Tim Clutton-Brock describe how differences in family structure across mammalian species influence aggressive and cooperative interactions, with potential implications for the understanding of the development of our own societies. Complex animal societies can be divided into two types. There are those where all group members pull together, helping to rear young produced by one of their members while suffering costs to their own individual breeding success and survival by doing so. Then there are those where group members compete frequently, aggressive interactions are common and individuals often form transitory alliances with each other to compete with other members of their group. Lukas and Clutton-Brock's recent analysis shows that mammalian societies of the first kind are ones where average kinship between group members is high, while those of the second kind are those where average kinship is low. Unsurprisingly, cognitive abilities and brain size appear to be more highly developed in species with the second type. Most of the social primates live in groups where average kinship between group members is low, competitive interactions are common, cooperation is based on exchange, manipulative tactics are well developed and unselfish helping to rear young is rare, so it is likely that the common ancestor of apes and hominids showed all these characteristics. 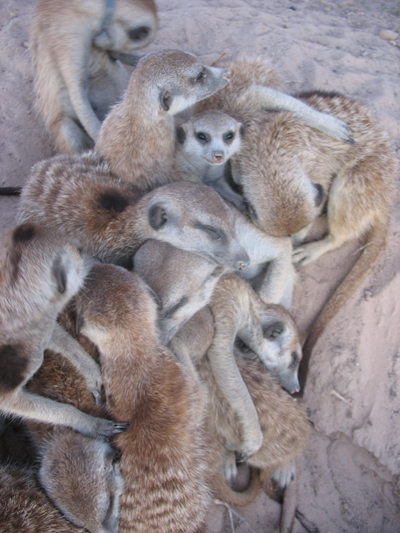 Image above: Meerkat group by Dieter Lukas.